Internal viewing is highly recommended of this three double bedroom town house. 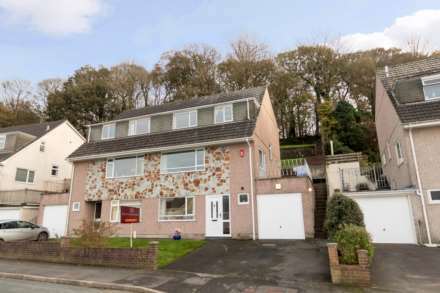 The property is very nicely presented and would make a perfect family home or an investment opportunity. This home has recently had a number of improvements made to include a newly fitted kitchen and landscaped garden with hot tub. The accommodation is set over three floors with cloakroom, kitchen and lounge/diner to the ground floor. On the first floor are two spacious double bedrooms and family bathroom with the master bedroom suite to include dressing room and en-suite shower room on the top floor. Outside the garden is predominantly to the rear which is enclosed and offers some privacy. A side access gate also leads to the driveway parking and garage. Offered with NO ONWARD CHAIN. Saltash is a thriving town across the River Tamar from Plymouth, and is known as ‘The Gateway to Cornwall`. The town centre has shops, cafes, banks and a variety of other services, plus two doctors` surgeries, a library, and a leisure centre close by. There are several primary schools, a secondary school and college. Plymouth is within easy commuting distance, and there is easy access to the south Cornish coast or to inland attractions such as the Tamar Area of Outstanding Natural Beauty, and the National Trust Estates of Cotehele and Antony. The hallway and gives access to the downstairs cloakroom, kitchen and lounge/dining room. Staircase rises to the first floor landing having the added benefit of under stairs full height storage cupboard with ample fitted shelving and fitted carpet. uPVC double glazed window to the front aspect with opaque glass. Suite includes low level W.C., corner wash hand basin and radiator. This room is a project for someone to complete as a new suite is available. uPVC double glazed sash window to the front aspect. This attractive newly fitted modern kitchen has contrasting two tone high gloss base and wall units with solid oak work surfaces and tiled splashbacks. There is a built in gas oven and hob with modern circular extractor fan over. An inset composite sink and drainer with mixer tap, integrated dishwasher, washing machine and further space for American style fridge/freezer. Inset lighting and ceramic floor tiling. uPVC double glazed French doors lead out to the rear garden. Under stairs cupboard with ample storage. Sky and aerial connection, power points, twin ceiling light points and twin radiators. Laminate flooring to the dining area and fitted carpet to the lounge area. From the hallway proceed to the staircase with fitted carpet and shaped balustrade. This generous double bedroom has a sash uPVC double glazed window to rear aspect overlooking the garden. Central ceiling light point, TV point, telephone point, ample power points, radiator and fitted carpet. This double bedroom benefits from twin sash uPVC double glazed windows to the front aspect with roof top views. Central ceiling light point, ample power points, double panelled radiator and fitted carpet. This modern style bathroom suite comprises of a white three piece suite to include, low level WC, pedestal wash hand basin with mixer tap and panelled bath. Shaver socket point, ceiling mounted extractor fan, radiator and fitted carpet. The room has been part tiled with contrasting tiling. This landing gives access to the master bedroom suite taking up the entire top floor. Radiator and fitted carpet. uPVC Velux style window to the rear aspect. Low level WC, pedestal wash hand basin with mixer tap and separate double size shower cubicle with mains shower. Built-in linen cupboard, radiator and fitted carpet. To the front of the property is level pave access to the front door. The enclosed rear garden has gated side access. It is laid out over two tiers with the main garden having a generous paved patio/seating area with central astro-turfed lawn. Steps raise to the raised tier with has a sunny decked area and this is where the hot tub is situated. There is also a stoned raised border. The garden is fully enclosed making it pet and child friendly. The vendor has advised that the council tax band is C.